Sometimes it comes when I least expect it, other times it is when I most suspect it. Regardless, the visceral reaction is always the same. I open a CT scan, chest x-ray, or message from a specialist and a lightning bolt of doubt, dread, and despair hits me square in the chest. It’s enough to make you forget to breathe for a second, enough to make all other clinical tasks for the day of instantly lesser importance. It’s a double edged sword because screening for cancer, disease, and other afflictions is our job. Our goal is to discover things early so that adequate treatment options are available. However, when we find cancer or other deadly diseases, we dread what comes next. We think, why couldn’t that colonoscopy be done sooner? Why did the patient wait an extra year for their mammogram? Why did that patient ignore a 50 pound weight loss and easy bruising? For me, the moment I find out I must give bad news, my entire day changes. I find it difficult to focus, complete my documentation, or even eat lunch. I find less joy in a well child check and more dread over the 2:40 appointment that is looming. It becomes impossible for me not to put all of my thought into the terrible, horrible task in front of me. In healthcare, we have the privilege of helping patients through some of their best days. We deliver babies, tell an expectant mother she will have twins, or tell a patient that their father’s surgery went perfectly. However, we also give grim prognoses, talk of cancer spreading, failing health, and have enormously challenging conservations with our patients. This article will focus on strategies, tips, and challenges with one of the most challenging topics in health care: giving bad news. Bad news in general remains on a spectrum. In some cases, a sprained ankle keeps a high school basketball player out of the playoffs, in other cases, we find a cancer we did not know was there, or tell a patient that despite aggressive treatment, their disease has progressed. 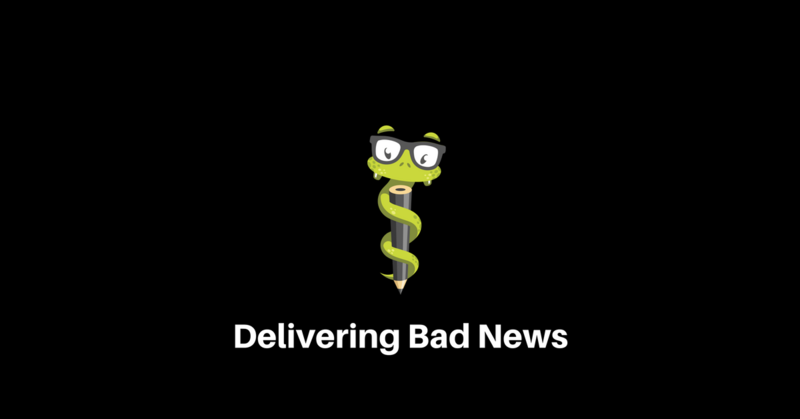 Regardless, giving bad news is never easy and doing so in a tactful, succinct way is imperative to patient coping, satisfaction, and ultimately the patient clinician relationship. Obviously each specific case will vary, but there are certain approaches that remain beneficial and successful across many situations. The first thing to consider is the patient themselves. Prior to meeting with the patient, a clinician should consider the patient’s beliefs, education, background, and personality prior to discussion. Obviously in emergent settings, this may not be feasible. The vast majority of studies related to giving bad news indicate that about 95% of patients want to know their diagnosis (Harman and Arnold, 2018). In Western culture, patients generally prefer knowing the diagnosis and gaining information through communication. One of the best approaches to giving bad news is the widely used SPIKES approach. This pneumonic stands for Setting, Perception, Invitation, Knowledge, Emotions, Summary. Setting in general is very important, as it can make or break a communication session. Clinicians should set aside ample time in a private, quiet, inviting space to discuss bad news. Whatever family the patient wants involved should be allowed to participate. Pagers, phones, computers, and other devices should be placed aside. The other aspect of setting includes getting all of the information prepared for the patient prior to the appointment. In my practice, I make sure that once I know I am giving bad news, I consult with specialty, confirm appointment times, and make sure I have a competent understanding of the steps of diagnosis and potential treatment options. This can take a lot of uncertainty off of the patient and family. Perception is an important part of the discussion as well. Gauging what the patient’s understanding and perception of the events leading up to the appointment is helpful. Asking open ended questions such as, “What do you know about how your cancer treatment has gone?”, or “What did the emergency department provider tell you about your CT scan?”, can ease into the conversation and allow the clinician to gauge the patient’s knowledge. It is important to understand that the vast majority of patient’s do not have a lot of medical knowledge. At best, many Americans understand basic health, directions on medication labels, but one should not assume that they know a lot more. This is a common mistake by clinicians. Once the subject is approached, the clinician can gently ease into the difficult topic. A common practice is to ask for permission or an invitation to progress with the discussion. A phrase such as “Is it okay if I share with you some news about your CT scan” can be helpful. Setting the stage for the delivery of the news is important. I like to make a short summary of what has been leading up to whatever test I have ordered and then give the news. The actual delivery of the news is paramount. Explaining the knowledge is the next step. Patient surveys show that the news is best appreciated in person, with a clear, direct approach that is void of any medical jargon or large words. The clinician should speak with tact, but be honest regarding the diagnosis. A short pause after the delivery sentence should be allowed so that the news is received and the patient/family can begin to reflect and react. Words like metastasis and cardiomegaly should not be used. Honesty is important, as is optimism. After the initial pause related to the delivery of news, the clinician should be ready for the emotional aspect of the discussion. In the strictest sense, the presence of strong emotion can usually indicate the patient received the news. Depending on background, personality, and many other factors, emotions can be mixed. Some patients may express sadness, frustration, anger, despair, disbelief, and every other emotion in between. Family members may have similar reaction. During the challenging time, any reaction should be anticipated. The conversation may shift from being directed by the clinician to being driven by the patient. Empathy is a very important skill in the emotional stage of the SPIKES acronym. The clinician should show compassion, attentiveness, and empathy. Allowing time for the patient and family to ask questions about prognosis, treatment, options is very important as well. In the closing aspect, the summary and support should be discussed. A quick summary of the previous steps as well as the steps moving forward can be helpful. Patients may feel alone, desperate, and in shock. Arranging a follow up in a week or two to check in allows the patient to know that you are on their team and will be available for them through difficult times. An ongoing relationship with your patient is important to help them navigate the coming steps. Another tactic that can be helpful for clinicians to discuss is the impact that the news has on the patient. In many cases, clinicians do not consider what the diagnosis or news may mean for the patient or their family. Asking about how the news will impact the patient’s daily life can be helpful, as a study indicated that when patients felt like the impact on their life or activities of daily living was mentioned, they had less anxiety, better compliance to treatment, and higher satisfaction in their provider. Giving bad news is never an easy thing, nor is it one of the positive aspects of being a physician assistant. Improving communication skills, increasing gratifying patient relationships are ways to improve patient satisfaction and clinician comfort with giving bad news. The SPIKES pneumonic is a useful tool to guide clinicians through difficult situations. Harman, S.M and Arnold, R.M (2018). Discussing Serious News. UpToDate, Date of Access 18 April 2018.